And thus it is that Christopher Bailey has been crowned fashion royalty. What he has achieved is way beyond the number of awards he has collected, or the amount 154-year-old Burberry has grossed under his creative leadership. He is officially the closest thing London has to King Karl of Paris. The show, held in the Chelsea College of Art in Westminster and broadcast live online in HD and in 3D at selected venues, plus all the buzz around it, were perfect proof of that. I'd rather skip going through the endless celebrity guestlist, after all, it's the clothes we're here for. Here's the lowdown. The focus was outerwear, with a collection built around shearling jackets and coats (think first world war flying aces), classic military-utilitarian, and finally, the simplest kind of dressy, sleek military peacoats and jackets. First, it was all khaki, mustard and lime, and lacy or ruched pieces providing a subtle backdrop to giant collar shearling aviator jackets in brown, khaki or natural. Next came the pieces that screamed new season staples the loudest, in the most sophisticated and flattering-all shade of navy ever beheld by man, be still my beating heart. A whole array of navy slim jackets, blazers and peacoats with brass buttons, paired with classic charcoal shirts worn as dresses, or with slim-leg trousers. 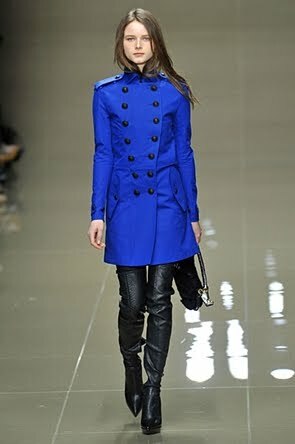 The odd piece floating on a sea of navy, a royal blue jacket with black military buttons just seemed to explode on the runway. 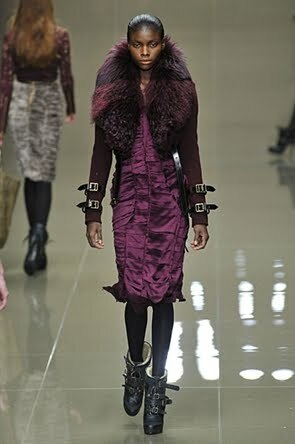 For the evening look, Bailey sent brown ponyskin and brushed sheepskin coats, as well as outfits in wine and magenta down the catwalk in a dash of velvet, lace and silk, before three outrageously beautiful shearling trench coats wrapped up the show. Burberry is the first, and so far, the only big name in fashion that has made a digital presentation worthy of the brand and its collection. And more than just that, it embraced all audiences. Connecting with its fans from all around the world and all walks of life is a sign of dedication and true grandeur. We love you Christopher. Rock on forever.